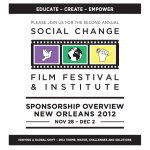 The partners at Fund Balance are delighted to recommend to our friends and subscribers the Social Change Film Festival (SCFF). SCFF is led-up by economist Cynthia Phillips and her Global Change Media initiative. The event features Robert Redford’s new movie Watershed, the new movie about climate change called Chasing Ice, the new fracking film, Dear Governor Cuomo, along with Angelina Jolie’s film In the Land of Blood and Honey, among many fine entries. Both the SCFF app and screening room are up on the web. The Festival is happening now in New Orleans. The gala event is Friday November 30, 2012, and the festival wraps Sunday December 2, 2012. The content is going out on LiveStream and is being recorded for the launch of a new satellite and LiveStream channel in January. If you are in the area stop and participate. Or for $25 in the U.S. and $10 for international, you can engage and enjoy the SCFF activities and content online. This is a great opportunity for anyone at the intersection of culture and social change, impact investing, cleantech and social enterprise. Previous PostNeither The US Government, Big Oil, or Wall Street Rentiers Control The Price of GasolineNext PostAnnie Lennox to Narrate Documentary centered around Haitian Artist Frankétienne, 2009 Nobel Prize candidate. InfraRed Capital Partners Ltd. will join Prudential Plc, the largest U.K. insurer by market value, to invest in a 1 billion-pound ($1.5 billion) tidal-lagoon power plant in Wales. Royal Dutch Shell Plc made a sixth contract offer to the United Steelworkers union on behalf of oil companies amid the biggest U.S. refinery strike since 1980. Vestas Wind Systems A/S won an order from Gestamp Eolica SL to supply its wind farms in Brazil with 106 megawatts of total capacity. On the eve of a contract expiring for 30,000 oil workers across the U.S. Jan. 31, Royal Dutch Shell Plc representatives walked away from negotiations, according to the employees’ union. The Obama administration is proposing a $4 billion fund to reward states that exceed cuts in greenhouse-gas emissions, and wants steeper royalty rates for oil, gas and coal extraction on public land.